We put the Galaxy Beam through our usual battery testing procedures and we are now ready to share our findings with you. On a 3G network, the Samsung Galaxy Beam rations its battery very carefully and lasted for the almost unbelievable 11 hours and 58 minutes. It managed to beat the official estimate of just under 10 hours by quite a bit. 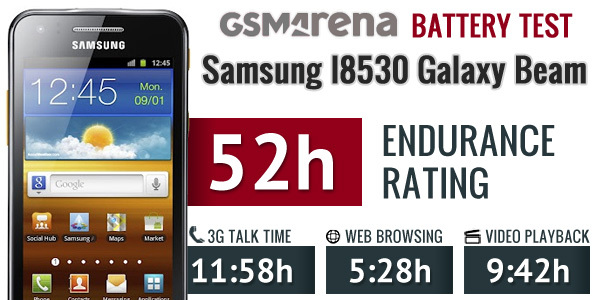 Web browsing didn’t produce as stellar performance, but at 5 hours and 28 minutes, the Samsung I8530 Galaxy Beam was still above average. We did expect with 2000mAh of juice, but as it does match the Galaxy S III flagship in this test, we’ll call it a win. The Samsung Galaxy Beam ran for 9 hours and 42 minutes straight, playing an SD video file, which puts it very near the top of our charts. Of course, this is when you watch the video on the screen rather than through the projector. We also tested how long the phone will last while watching movies with the built-in projector (Samsung is promising up to 3 hours or runtime). We set the projector at 100% brightness (the projector is rated at 15 lumen) and kept the screen on (its brightness was set to 50%). The Galaxy Beam surpassed Samsung’s official estimates – we waited 3 hours and 54 minutes before the phone threw in the towel. Note that we had the phone in offline mode, so you’ll get less battery life if you have wireless communications (3G, Wi-Fi, etc.) enabled, but you can switch off the screen (which is only needed for presentations, really) to get more out of it. We crunched the numbers and arrived at the impressive 52 hours endurance rating – the Galaxy Beam should be good for a little over two full days of usage if you do a 1 hour of calls, 1 hour of web browsing and watch 1 hour of videos per day (note that this estimate includes watching videos on the screen only so that it’s comparable to the results of regular phones). The excellent stand-by endurance greatly helped the Galaxy Beam achieve this kind of endurance. That’s one of the best results this tests has seen and Samsung deserves a pat on the back for that. We wish we had gotten a bit more web browsing time from the Samsung I8530 Galaxy Beam, but it still did very well and the phone is great when it comes to talking for hours on end or watching lengthy movies – you can even watch a feature film or two (depending on length) using the projector. Plus, the phone ships with a spare battery (and a battery charger!) inside the retail package, so it might really become a favorite of those, who don’t like charging their smartphones too often.